Note: There's about two weeks between the session and me writing this, so there may be some details simplified, omitted, or maliciously fabricated. We discover that Boots had remained back in town for an extra day to do further research on the mine the party was heading to. There, he discovered the mine's "moon door"entrance, as well as, as far as he could tell, the Forge Hammer had never left the mine. Armed with this tiny bit of information (and his flute) Albrecht assigned three of his guards to accompany Boots up to the site to join up with the rest of the party. Conveniently arriving at nightfall, Boots and the guards easily found the door. While two of the guards set up camp nearby, Boots entered with one of the guards—named Horace— to search for the group. Shortly after dispatching a small group of kobolds in the Great Forging Hall, the party was met by Boots and Horace. Boots caught them up to speed (it didn't take long, he didn't learn very much). Once done they decided which way to set out. The hall had four exits, two on each side. The party decided to enter the double doors in the south-west wall. Through the doors they entered a long hall ending in another set of double doors and a set of doors on either side of the hall halfway down. Once they made their way to the single doors they opened each on in turn and found the same thing on either side: old weapon rooms, now filled with rusted and decrepit dwarven weapons covered in cobwebs and dust. Most noticeably, however, both rooms were covered in long dead creatures—mostly kobolds, dwarves, and giant rats. A blanket of ominous fungi carpeted the floor and bodies. Not willing to tempt fate, they party closed the doors and moved on towards the end of the hall. Moving on they reached the end of the hall and swung open the double doors at the end of the corridor to find a equipment storage room lined with rusted blacksmith's tools and old shelves. in the north wall of the room there were also three kobold holes in the wall. Soon after entering the room the sounds of kobolds moving through their tunnels could be heard. As kobolds attempted to attack from their holes both Horace and Audrey struck them down as they entered the room. From the north "fungus room" a group of kobolds spilled out into the hall that Ander and Broak attacked and the party's sole spell caster was finally able to use his mastery (well, first level mastery) of the arcane arts. During all this excitement Grabby decided to just hang back and search the room... which paid off! He found a secret door against the west wall. Once the dust had settled and several kobolds lay dead, Grabby pointed out his discovery to the others. 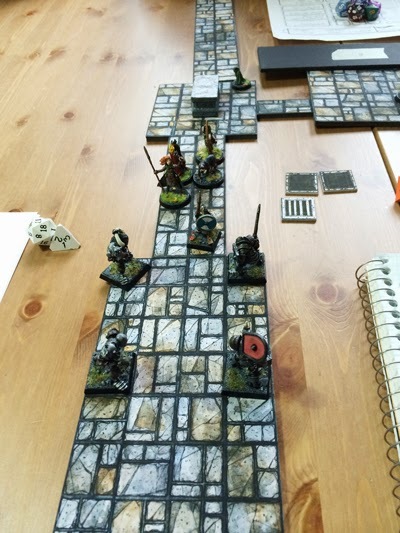 The party readied themselves then moved through the secret door. They found themselves in a short, narrow hall ending in another secret door. Passing through the second door they entered a small room, lit only by their torches. The chamber was filled with a thick layer of dust and webs—obviously the dimwitted kobolds were unaware of this area, as it had not seen any traffic in what must have been hundreds of years. In the centre of the room was a wide stone sarcophagus with a relief of a dwarf warrior lying atop its lid, carved lying down, at peace, with his battle axe grasped in his hands. Pitch black corridors extended to the north and south. Thinking that the Forge Hammer might (or other treasure) be withing the resting place of the dwarf warrior, the party—particularily Boots—felt it would be wise to pop it open and take a look. This did not go over well with Broak. Tired of arguing, Boots decided to take matter into his own hands and began smashing the top of the sarcophagus, damaging the carved dwarf image. This also did not go over well with Broak, and resulted in a swift punch to Boots' kidney, dropping him to his knees. After a long argument discussion they decided to leave the sarcophagus undisturbed, for now at least. They decided to then move on down through the cobweb infested south corridor while leaving Horace in the room to watch their rear. Eventually the hall opened into a long room. Set into the floor were the lids of six more sarcophagi, also with stone images carved into their faces of dwarf warriors, weapons clasped in their hands. Obviously warriors of great renown. In each corner of the room were iron statues of heavily armoured dwarf warriors armed with massive weapons. On each of their breast plates were a different carved single dwarvish ruin of unknown meaning. Again, another discussion began on opening these tombs to see what they held, and again, Broak would have none of it, preferring to respect the peace of his dead brethren. When Broak finally began to realize he was on the losing side of the debate, he did what any respectable warrior worth his dwarvish salt would do: he stormed off in a huff back towards the secret door they had entered, with Grabby running after him to convince him to stay. With the dwarf leaving, it was time to crack open some sarcophagi. When Audrey and Boots began prying open the first sarcophagus, the runes on the iron statues began to glow with an eerie arcane light and slowly the statues came to life. A melee quickly ensued as the animated statues moved in to defend the tomb and Horace moved up to help his allies. 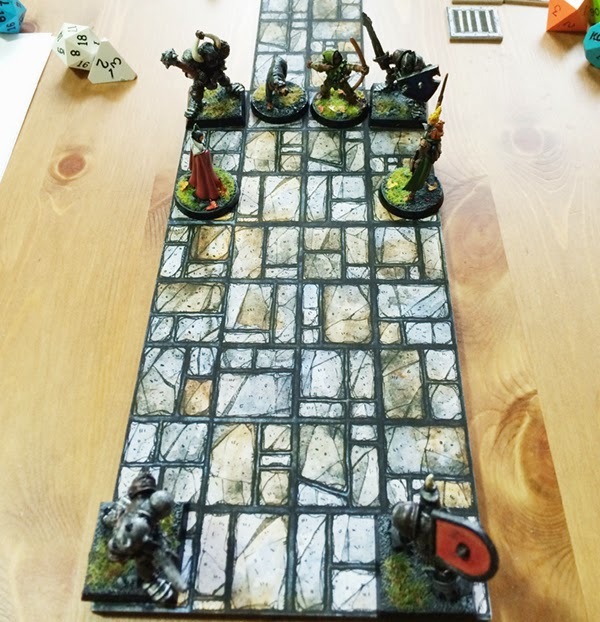 As blow after blow to the statues seemed to do very little damage, the party decided they might be outmatched so they started to fall back to the other tomb chamber. As they fell back, Horace started to fall behind as he continued to attack the statues then found himself surrounded. Despite his heroic attempt, he was seriously wounded by the statues' attacks before he could fall back to the rest of the party. As all of this was going on Broak was still continuing on his way out, but as he entered the hall, he opened a door to be greeted by a group of giant centipedes (an ill-timed wandering monster encounter). As Broak and Grabby fought off the centipedes, the rest of the group engaged the statues in the tomb chamber, their attacks seeming to do little, but they did manage to concentrate their efforts on one of the aberrations to damage it significantly. Overpowering the group in cramped quarters, the statues managed to fell poor Horace and trample over his crumpled corpse as they pressed their attack. Seeing this the group fell back further to join in the room with Broak and Grabby. The dwarf and the halfling eventually managed to kill all of the centipedes—probably with the help of some of the other, I can't recall. Once the party had all entered the room through the secret passage, the statues seemed to pause then cease their attack. They then turned around and mindlessly shambled off down the hall, presumably to return to their eternal posts. Audrey and Boots cautiously returned to the smaller chamber to crack open the sarcophagus, slid the lid open only to find... nothing. Barely a speck of dust.